The last word in quiet Intel Xeon cooling for LGA3647! Noctua’s DX line CPU coolers have become a default choice in premium grade quiet cooling solutions for Intel Xeon processors. The NH-U12S DX-3647 features a larger, custom-designed contact surface and supports both square and narrow type LGA3647 platforms. Based on the proven, 120mm size NH-U12S heatsink and equipped with two of Noctua’s award-winning, PWM controlled NF-A12x25 120mm fans, it provides an excellent balance of performance, compatibility and quietness of operation. Topped off with the professional SecuFirm2™ mounting system and pre-applied NT-H1 thermal compound, the NH-U12S DX-3647 forms a complete premium quality package for quietly cooling LGA3647 based Xeon workstations and servers. 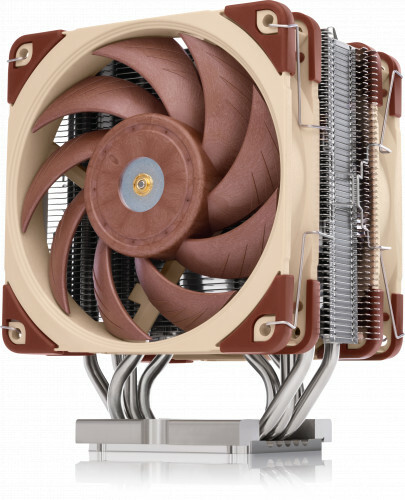 First introduced in 2008, Noctua's DX line CPU coolers have become a standard choice when it comes to quiet, premium grade air cooling solutions for Intel Xeon processors. Thanks to their superior acoustic efficiency, they are ideal for workstations and servers that run in noise sensitive environments (e.g. audio/video production, content creation, engineering, etc.). The new DX-3647 line coolers are dedicated, customised solutions for Intel's professional LGA3647 platform, which makes them an ideal fit for both Skylake-SP based Xeon Scalable CPUs (Platinum, Gold, Silver or Bronze, Purley series) and Xeon-Phi processors (code names Knight's Landing or Knight's Mill). At 70x56mm, the heatsink's copper contact surface is more than double the size of the standard model. Tailored to fit the enormous integrated heat-spreaders (IHS) of Intel's LGA3647-based processors, this customised design allows for an optimal heat flow from the CPU over the base to the heatpipes and on to the cooling fins. The heatsink's SecuFirm2 mounting system includes two sets of brackets in order to support both square and narrow type LGA3647 sockets. Thanks to pre-installed mounting screws and the included processor clips (square type and narrow type without Omni-Path fabric connector, with fabric connector on request), the installation procedure is easy, quick and secure. With five heatpipes and two next-generation NF-A12x25 120mm fans, the NH-U12S DX-3647 achieves outstanding cooling performance while maintaining excellent compatibility: At 158mm height and 125mm width, it is short enough to fit most modern tower cases and stays clear of the top PCIe slot on many motherboards. The NH-U12S DX-3647 is equipped with two of Noctua’s award-winning, next-generation NF-A12x25 120mmm fans. This exquisite, state-of-the art push/pull dual fan configuration allows it to achieve a remarkable level of quiet cooling performance despite its relatively compact size. The NF-A12x25 premium fans supplied with the NH-U12S DX-3647 support PWM for convenient automatic speed control through the motherboard, which allows them to run near silent at lighter loads and to speed up only when necessary. The supplied y-cable makes it possible to power and control both fans simultaneously from a single motherboard fan header. Noctua's much-acclaimed NT-H1 is a pro-grade TIM solution that provides minimum thermal resistance and outstanding long-term stability. Having the paste pre-applied to the heatsink base ensures optimal bond-line thickness and saves precious time in installation. Ideal for system integrators! Noctua products are renowned for their impeccable quality and outstanding longevity. True to this legacy, the NH-U12S DX-3647 heatsink is built to last, and like all Noctua fans, the supplied NF-A12x25 units feature an MTTF rating of more than 150,000 hours. The entire package comes with a full 6-year manufacturer’s warranty.